Known only as the “Red Brick Building” in its early years, Alexander Hall was designed in the Romanesque Revival style by John Parkinson, a prominent Seattle architect of the day. Who could blame Adelaide Beers if her first glimpse of the “Red Brick Building” left her queasy? It was 1893, after all, and the teacher of music and higher mathematics had traveled with her husband, Alexander Beers, more than 2,300 miles by train from Spotsylvania, Virginia, to 40-year-old Seattle to establish a Free Methodist school called Seattle Seminary. Begun in 1891, ground had been broken, an architect employed, and a school building erected. But standing there, taking in the Seminary plot for the first time, Adelaide was fixed on one thing. It wasn’t the exterior of the imposing four-story building that was the problem. From its slate roof to its octagonal towers atop each corner and its finely wrought arch entrance, the brick edifice presented a beautiful and sturdy exterior. No, what caused her indigestion that damp March morning was the adjacent 5 acres. She labeled them “coarse” and “unadorned” in her 1922 biography of her husband titled The Romance of a Consecrated Life. The building would one day be renamed Alexander Hall, situated at the center of a campus recently named to a list of the “Most Beautiful Christian Universities.” But on this day it rose from a cow pasture studded with blackened stumps. Seattle’s notorious rainy season had already caused the newcomers “a good deal of difficulty.” To reach the property, they’d had to travel on foot over a narrow, muddy half-mile trail from the nearest streetcar stop. The shiny new Red Brick Building only accentuated its grim surroundings. Meanwhile, the building’s unclean, unfinished, and unfurnished interior, heavy mortgage, and small enrollment soon completed a bleak picture for the newcomers. Adelaide couldn’t help but harken back to her recent life at a seminary in Virginia — the southern hospitality, the frequent invitations to dine in the finest homes, and the buggy rides in the country with Alexander. Still, despite their misgivings, the couple would press on. They had answered the call. They were Free Methodist pioneers, educators, and missionaries to the Pacific Coast, which implies a degree of personal sturdiness. The first day of school loomed, and there was a Red Brick Building in need of preparation. Alexander recruited “a cleaning force,” and they scrubbed inside the building from top to bottom. Desks were placed in the chapel, and the following Sunday the first church service was held, the first sermon preached, and the first public prayer offered in dedication of Seattle Seminary. No sooner had Alexander begun to pray down God’s blessings, wrote his wife, “than the heavens seemed to open above and the room was filled with the presence of Jehovah.” Adelaide’s “grippe” was instantly healed, and Alexander’s doubts were swept away. Their faith had been tested, and it was not found to be lacking. Although there were just a dozen students on opening day, by the close of the semester, there were three times that many, and the future brightened. Alexander, a staunch prohibitionist, was urged to run for Seattle mayor on the anti-liquor ticket, but declined. Principal Beers had a school to run. Five years later, after much sacrifice and diligent fundraising, the mortgage on the Red Brick Building was paid in full and burned on Alexander’s 31st birthday. 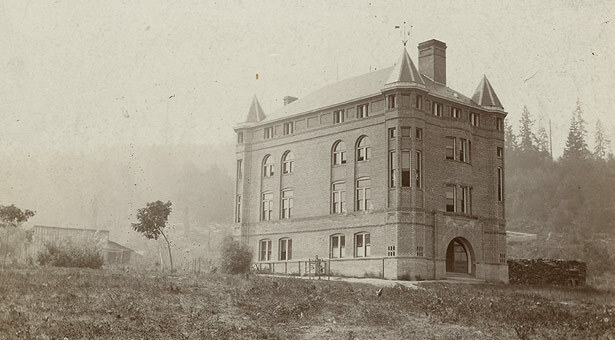 Indeed, by the time of publication of the 1904–05 Seattle Seminary Catalog, a very different picture emerged of the first campus building, its prospects, and its surroundings. Now also known as “The Main Building,” the original hall was extolled as a “fine four-story brick structure” heated by hot air, lighted by electricity, and “an ornament to the campus.” It contained a dining room, pantry, and creamery; a chapel, classrooms, and library; sitting rooms; dormitories for students; and bedrooms for teachers. Along with the new enthusiasm came a renewed confidence in the original vision — to send graduates into the world to do good. Within 10 years the enterprise would be known as Seattle Pacific College, and the faith of its founders validated. By then two more buildings — a girls dormitory and an administration building (Peterson Hall) — had been built. “The buildings are strictly modern and well adapted for school purposes,” boasts the writer of the Catalog with more than a hint of Adelaide’s literary style. The Seattle rain, so malodorous when the Beers arrived in 1893, now ensured that “the lawns are green throughout the entire year.” Stumps are nowhere mentioned. January 2016 update: The renovation has been successfully completed, but you can still add your story about the historic Alexander Hall. Read what other alumni wrote, and add your memories. Answers may be edited for clarity or length.